Please find answers to some of our most commonly asked questions. Click on the question text to expand the answer. How do I get to the forums or refer a colleague? Once you are on the Community of Practice page, click on “log in to post new content in the forum.” When you reach the login page, you should see space for your username and password, with a login button beneath. 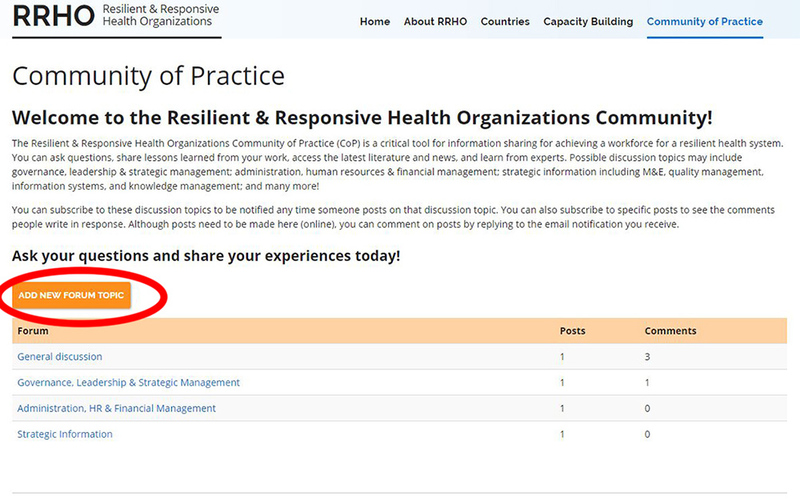 On the Community of Practice page, click on “log in to post new content in the forum.” When you reach the login page, select “create new account” from the tabs above the username field. Fill in your email and other information, and scroll down to select the “create new account” button. If your email matches an existing account, please reset your password. From the login page, please select “Reset your password.” Once there, please enter the username you created when you made the account, or your email for the account, then press submit. An email with password reset instructions will be sent to your registered email address. How do I post a new forum topic? From the Community of Practice page, click “Add new forum topic.” You’ll see the new topic page, where you can enter a subject and body text. Also, please select the forum in which you would like to post the topic. Where can I find my forum topic? You will find your forum topic within the forum you selected when you posted the new topic. The forums are: general discussion, governance, administration, and strategic information. How can I comment and reply to topics and comments? You may add a new comment at the bottom of the topic or to reply to a specific comment, select “reply” underneath the comment text. You may also reply to comments via email by replying to the email notification you receive. How can I delete or edit a topic I’ve posted?